Quality piece. Added this to my entire bedroom set. Drawers slide well. Looks stunning. Always get compliments. 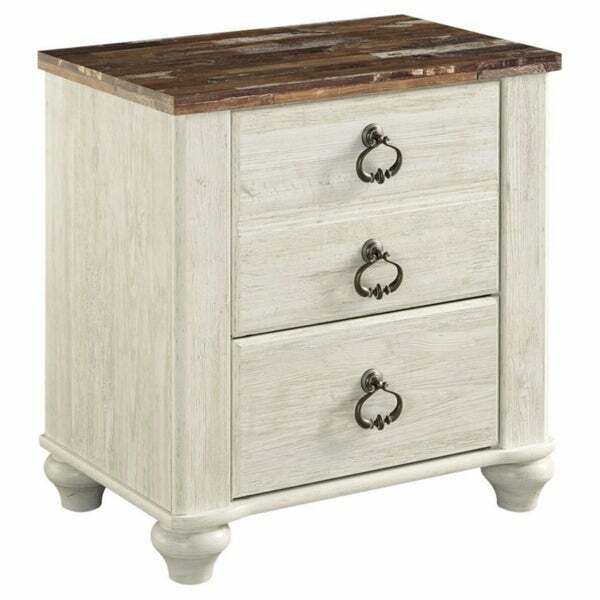 The Willowton nightstand is the ultimate statement piece for your coastal cottage or shabby chic inspired retreat. Whitewashed finish on the drawers and sides is wonderfully easy on the eyes. Paired with the unique plank-style top, it's a driftwoody look that has our minds drifting away to beachy-keen escapes. After a little sketchy start, I received the wrong product first and had to return it, then Overstock sent me the correct one 2 day shipping, this nightstand is beautiful, mine came with a cracked bottom drawer and Overstock is sending me a new drawer so I dont have to package the whole thing up again, I will say I give it a high rating, Its beautiful and beachy and is very unique, came already put together, all i had to do was the feet and the front hardware, but beautiful for the price and perfect height for my new bed!! Eventually i will be ordering another to have a matching set!! I’m in love with Ashley Willowton furniture. It fits perfectly with my farmhouse style decor. Love the grey, brown and cream color tones on the top! I was surprised to find a UBS set up in the box that attaches to the back! Very pleased with this purchase! The description says that it is “made from wood”. It has a printed wood look on both top and bottom--I am very sorry as I was excited about this purchase. It is being returned as the quality is not what I expected. I have the whole set but only one side table so I ordered a second. It matches beautifully and although it came with missing drawer pull screws Overstock got them delivered pretty quickly. Very happy with my purchase. I ordered this to go with a matching bedroom set and it was perfect. Very easy to put together. Also has a USB port that attaches to the back which was a very nice surprise. Even has the cords and plug. The night stands fit in perfect with the nautical theme in my beach house. Very heavy and sturdy. The top is a laminate but it looks nice and is stain resistent for spills. The top of the nightstand is a picture of distressed wood laminated onto cheap mdf pressboard. The entire piece is mdf pressboard, not real wood. Very low quality, not the real deal. These are pretty but they cut a few corners. The top is some sort of print not reall wood just particul board with print laminate and the feet are some sort of plastic material. They have a nice look but cheaply made. I rated this Night Stand 3 stars because the stand was really nice, but broken. It looked like someone tried to put it together then attempted to return it. I was really disappointed but overstock sent me a shipping label and was easy to work with with this particular merchandise. Color is very white but pretty. More light weight than I anticipated. Love this nightstand. Very cute! Price was great as well. Perfect condition and came already put together. "how much does this weigh?" Its the piece needed to complete the collection and it was less expensive at Overstock than what I paid previously. "What are the dimensions for the piece?" This nightstand measures approximately 23.74 inches wide x 15.75 inches deep x 25.67 inches high.